Buy Clublaptop Reversible 13.3 inch Laptop Sleeve online - Clublaptop - The largest online store by Manufacturer of Laptop Accessories and Spares. Clublaptop reversible laptop sleeve protects your laptop from those unwanted scratches and dust when you leave your laptop after work. This laptop sleeve is ideal for both men and women. You can perfectly accommodate your laptop in this Clublaptop Reversible Laptop Sleeve. Crafted from neoprene material, thislaptop sleeve is also perfect for carrying your business documents and bills. The reversible feature of this laptop sleeve makes it unique and sets it apart from other laptop sleeves. 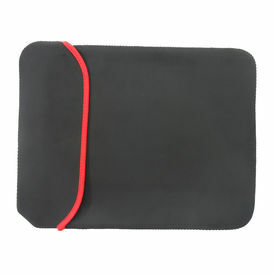 You can use it both ways to flaunt as Red Or Black laptop sleeve. Product Code LSLEEVES CL 13.3"